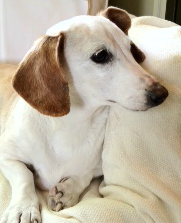 LULU left her wonderful mom on 10/5/12, after spending four wonderful years being loved. Lulu was a rescue dog that found her forever home with her mom Adriana late in her life – Adriana opened her heart to this older girl knowing she had been treated for skin cancer and had just undergone surgery for a mammary tumor. LULU had not had an easy life before finding her mom – but she quickly let go of the past and enjoyed every second of her second chance. LULU found the most amazing home with her mom and loved her life and was so loved by everyone that met her. LULU was funny and sweet and stubborn at times – but always brought her mom joy! She never got to meet her cousin dog Keira – but her aunt and mom started a business named after both girls – and LULU will live on !